Overview - A dark twist on the classic fairy tale, in which Snow White and the seven dwarfs look to reclaim their destroyed kingdom. In the included special features for 'Mirror Mirror,' the movie's producer describes the filmmakers' goal of recreating the magic and spectacle of classic animated fairy tales in a live action setting. Unfortunately, I think they may have interpreted that aspiration a little too literally, as the end results are riddled with two-dimensional characters, scripting, and direction that all feel far more lifeless and flat than any of the wondrous animated productions that it seeks to emulate. An attempt at a light, fluffy, comedic take on the classic 'Snow White' fairy tale, the movie lacks any real spark of imagination or wit. While the visuals can be impressive, they simply serve to mask a paper thin plot and a disappointingly dull experience. A slight twist on the famous Brothers Grimm fairy tale, 'Snow White,' the story takes place in a magical land ruled by a wicked Queen (Julia Roberts). When a handsome Prince (Armie Hammer) falls in love with the Queen's beautiful stepdaughter, Snow White (Lily Collins), the evil monarch becomes jealous and attempts to have Snow killed. The innocent girl manages to survive, and soon befriends a band of seven dwarf bandits living in the forest. Together, they join forces to thwart the Queen's wicked rule and save the Prince from her nefarious spell. Taking a cue from contemporary Disney/Pixar efforts and the 'Shrek' films, the movie attempts to blend a modern sense of tongue-in-cheek humor with classic fairy tale sensibilities. Unfortunately, the filmmakers lack the wit, finesse, and charm of those inspirations. This leads to a very light, goofy, silly tone that while occasionally "cute," never really amounts to much entertainment value. The comedy is excessively simple, uninspired and immature, and there really aren't any laughs to be had. Though clearly geared toward children and families, even kids will likely be unimpressed by the lackluster gags. There are a few self-referential jokes that show promise, but the script fails to truly commit to a comedic rhythm or style. At times it appears like the filmmakers are going for something akin to 'The Princess Bride,' but they hold back and instead leave us with a surprisingly dull, by-the-numbers experience. Even ignoring the lack of effective humor, the actual scripting is quite pedestrian. The plot is extremely simple and very thin. The pacing feels clunky and there are times when sequences seem haphazardly stitched together with no natural flow. Snow White and the Prince's romance is quite laughable, and while I'm well aware that the movie is targeted at children, that still doesn't excuse the lack of development between them. They go from strangers to being in love with the snap of a finger. We're told that they should be together by the characters, but we never actually see why that is the case. Drama is also handled rather poorly. The light-hearted tone is so fluffy, that emotional beats and dramatic events carry no weight. The film's climax is also very underwhelming and the conflict gets wrapped up too quickly and too easily. Sure, there are some decent twists to the classic story, but the overall plot is so simplistic, that by the time the credits role, it doesn't really feel like anything has happened. Julia Roberts appears to be having fun as the wicked Queen, and while she does a solid job of hamming it up on screen, the performance is pretty one-note. Armie Hammer's Prince Alcott is similarly underdeveloped and it's hard to see why Snow White would be interested in such a shallow character to begin with. The actors who portray the seven dwarfs are all quite decent, and while their parts are underwritten, they bring some welcome personality to their roles. 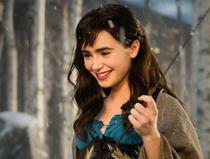 As Snow White, Lily Collins is the film's one bright spot. The actress looks like a classic Disney princess brought to life, and she lends the role an appropriately innocent but still feisty air. Unfortunately, like the rest of the characters, the part is severely underwritten and though Collins would seemingly make a great Snow White under different circumstances, as scripted the character fails to leave much of an impression. Despite the film's many problems, director Tarsem Singh does follow through with his trademark knack for striking visuals. Through a combination of stunning production design, costumes, sets, and VFX, the movie does indeed carry an impressive fairy tale visual aesthetic. Action set pieces are also well staged and though some CG work is a little spotty, the slightly cartoonish style suits the film's silly tone well. While the story lacks the charm and wit of Disney fairy tales, the director does successfully replicate an animated visual style in live action. 'Mirror Mirror' ultimately proves to be a visually impressive but utterly hollow film. It's pretty to look at, but it has nothing to say. The director has proven more than capable of balancing striking images with actual substance and heart in the past ('The Fall'), which makes this failure all the more painful. Though there are a few decent twists on the classic 'Snow White' story, the script lacks personality and the plot and characters are far too thin to engage. The light, goofy tone can be mildly amusing, but the humor is pedestrian and uninspired. Families looking for a harmless flick to show their kids might want to give this a rent… maybe, but honestly, they'd be much better off just showing them this. Ultimately, the movie commits the one cardinal sin for any fairy tale -- it lacks magic. 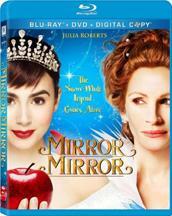 Relativity Media presents 'Mirror Mirror' in a Blu-ray/DVD/Digital Copy combo pack. A BD-50 disc and a separate DVD disc (that also houses the digital copy) are contained within a keepcase. A cool lenticular cover that switches between an image of Julia Roberts and Lily Collins is included, but in a rather perplexing packaging decision, it's stuck on over the actual plastic wrap that surrounds the entire package. This means you actually have to remove the lenticular card to unwrap the case. One can then theoretically stick it back on over the keepcase or just toss it away, but it seems like it would have made more sense just to package the damn thing under the plastic wrap to begin with. An insert with instructions for downloading a free song ("I Believe in Love" by Lily Collins) is also included. After some skippable trailers the disc transitions to a standard menu. The movie is provided with a 1080p/AVC MPEG-4 transfer in the 1.85:1 aspect ratio. Featuring some impressive cinematography and production design, the film sparkles on Blu-ray with a spectacular transfer. The digital source is clean and clear with no noticeable artifacts or noise. The image has a sharp, pristine quality, revealing all of the intricate details and fine textures in the lavish costumes and sets. Cast in a frequent golden glaze, the color palette can be surprisingly muted, but splashes of vibrant yellows and reds pop from the screen, contrasting nicely with their subdued surroundings. With that said, there are certain sequences that are simply awash with vivid colors (the Queen's wedding, for instance) and the screen absolutely lights up with rich saturation. Contrast is high without blooming and blacks are deep and inky throughout. The picture features a very stylized look, and while this lends the film an interesting, storybook aesthetic, some of the digital filtering and compositing can look a bit odd and unpolished. Eagle-eyed viewers might also notice a subtle purple ghosting effect around the edges of characters during fast motion, dimly lit scenes. This seems to be a result of the movie's shooting and post-production methods and not the transfer itself, and thankfully doesn't really detract from the viewing experience. 'Mirror Mirror' features some impressive visuals, and the film comes to Blu-ray with a very strong transfer. The image carries a great sense of depth and pop, and the sumptuous production design dazzles. Some of the stylistic choices and digital tinkering aren't totally refined, but the overall picture manages to impress greatly. The audio is presented in an English DTS-HD MA 5.1 track with optional English SDH and Spanish subtitles. Spacious and enveloping, the sound design transports the audience into a convincing fairy tale world. Dialogue is clear and full-bodied throughout. The soundfield is wide and immersive, dispersing subtle and aggressive activity throughout the room. Surrounds offer effective ambiance, bringing the film's forests, castles and towns to life with rich auditory texture. Effects work is precise and distinct, carrying crisp fidelity with every clanking sword and galloping horse. Directionality is smooth and natural, and various sounds (a door knock, for instance) are placed appropriately around the listening area. The film's action scenes are particularly impressive, including an early ambush with the seven dwarfs that utilizes the entire soundstage to engross the audience in fairy tale mayhem. Dynamic range is wide with clean highs and deep lows. Bass activity can be quite powerful, especially during the film's climax which features a battle with a roaring beast that circles the room from all sides. All of the effects, score and speech are balanced nicely together, giving dialogue ample room to breathe. Immersive and delicate, both small and aggressive sounds come through clearly and distinctly. The soundstage is lively when it needs to be, offering a varied and exciting auditory experience. Free of any technical issues, this is a very strong mix that bolsters the movie's exquisite visuals nicely. Relativity Media has put together a fairly mediocre selection of supplements including a few brief featurettes. All of the extras are presented in 1080p with Dolby Digital 2.0 audio and no subtitles, unless noted otherwise. Deleted Scenes (HD, 7 min) - Five deleted scenes are viewable separately or together. Mostly just minor extensions or quick, unnecessary bits, these are all pretty useless and skippable. Looking Through the Mirror (HD, 13 min) - This is a decent behind-the-scenes look at the making of the movie. Though it starts out as nothing more than an ego boost to the film's director with piles of compliments from the cast and crew, there are some cool details offered on the sets, costumes, and VFX. It might only be a fluffy, surface examination of the production, but it's worth a quick look. I Believe I Can Dance (HD, 11 min) - Fans who have been dying to learn the choreography for the film's closing dance number can now rejoice! Here, the movie's choreographer teaches viewers the dance moves step by step. I still need to work on my "Bollywood eyes." Mirror Mirror Storybook (HD) - This is a 28-page digital storybook version of the film that features text, images, clips, music and effects from the movie. The fact that the entire film can be summed up in 28 story book pages is pretty telling. Hell, I wouldn't be surprised if this is what the actual script looked like. Though kids might find some entertainment value here, I'm not really sure why someone wouldn't just watch the actual movie instead. Prince and Puppies (HD, 2 min) - In this featurette, puppies watch and critique Armie Hammer's performance. I'm not even sure children will find much to like here. Theatrical Trailer (HD, 2 min) - The film's trailer is included with Dolby Digital 5.1 sound. Sneak Peeks (HD) - Four trailers for other Relativity releases are included. 'Mirror Mirror' attempts to present a light, fun, silly twist on the classic 'Snow White' fairly tale, but it falls flat. The humor is uninspired, and the thin characters and scripting carry no weight or personality. Though the visuals are striking, there's just no substance to back them up. On the technical side, both the video and audio presentations are very strong, transporting the audience into a convincing fantasy world. Supplements, however, are disappointing and offer very few insights into the production. Though bland and dull, the movie does have some merit, and the disc's technical presentation is impressive. This is a rental at best.